Silicone stoppers for all Blomdahl titanium drop earrings and hooks. These will also fit other hooks up to 0.8mm gauge. Each stopper is 3mm x 2mm. I used these with the niobium hooks to ensure heavy earrings stayed put - and they did, perfectly. No worries about losing an earring with these! 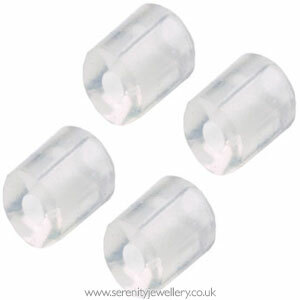 I prefer these to the larger stoppers that come with plain post earrings and have bought extra to swap. They fit all earring styles better altho are tiny to handle. Slippery little suckers when trying to get them on plastic hooks. Much easier on metal hooks. Plastic hooks are flexible so therefore harder to get them to stay still when pushing them into the stopper. Sturdy once on though. Thank you for these little miracles. The only time I went out without putting stoppers on I lost one of my pretty earrings. The other was found on the floor of the car. I'll be ordering more soon so I have every earring covered. Good to be able to buy these separately and stop hook earrings slipping off.